A multi-panelled bobbinet tulle corset with cut away cups and profuse lace appliqué. Boned throughout with 5mm spiral steel bones and 7mm flat steels. 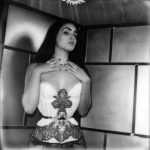 The multi-panel pattern is inspired by the work of Sparklewren corsetry, who drew the concept from an antique corset within the Symington collection, entitled the ‘Birdswing’ corset. 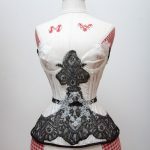 The corset is embellished with a variety of laces: cotton English leavers lace as an exterior decorative waist tape, and layered white French chantilly lace and black antique silk lace. All lace is delicately hand stitched with silk thread. Photography by A. Lindseth and Sparklewren, please refer to individual photos for full credits.